Issue 11 of Breathe, February 2018. The growing rise in healthy eating trends means less bread is being bought than ever before; as shop-bought loaves are swapped for sushi, grains and salad pots, less than half the population eats bread daily and factories have had to close their doors after decades of production. The biggest slump has been in the mass-produced white loaf, according to retail analyst Kantar Worldpanel, with sales of the market-leading brand down 11 per cent in 2016, representing a huge £57.6 million loss. In contrast though, home-baking, and in particular the slower, artisanal process of producing sourdough has never been more popular. Sourdough bakeries are springing up all over the UK, and the number of small mills grinding heritage flour by traditional methods is also on the rise. Anyone who has created a hand-made loaf, pulled from the oven with a bursting crust and accompanying homely aroma that fills the house, will understand the sense of pride and love that sharing it with others brings. But why choose to complicate further that alchemic process of kneading, proving and rising in order to produce a loaf that uses only naturally occuring yeasts from the air around us? There’s something about baking sourdough bread that feeds the soul. 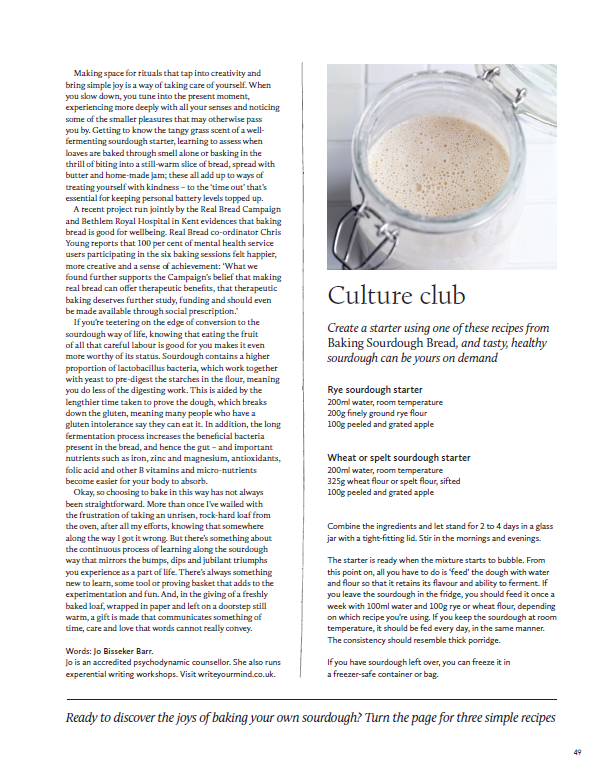 Anne-Marit Taylor who runs The Norwegian micro-bakery and baking school in Southbourne, Dorset, cites her own reasoning behind the growing popularity: “In our fast-moving automated, computerised world more and more people are realising how good sourdough baking is for body and soul. Using all your senses once you’ve mixed the dough to notice how it changes through the slow process of fermentation is calming and therapeutic; feeding a wholesome and nutritious loaf, free from artificial additives, to family and friends is a truly rewarding and fulfilling achievement”. 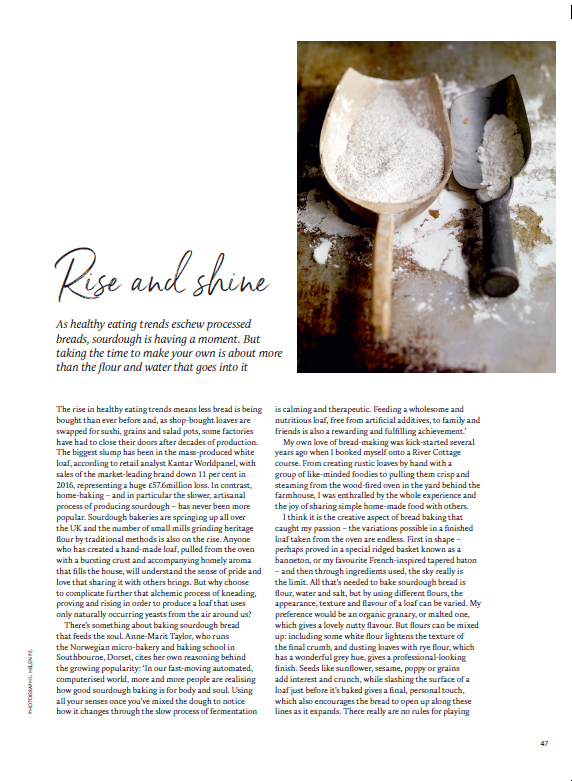 My own love of bread-making was kick-started several years ago when I booked myself onto a River Cottage course. From creating by hand rustic loaves with a group of like-minded foodies to pulling them crisp and steaming from the wood-fired oven in the yard behind the iconic farmhouse, I was enthralled by the whole experience and the joy of sharing simple hand-made food with others. I think it is the creative aspect of bread baking that’s caught my passion – the variations possible in a finished loaf taken from the oven are endless. First in shape - perhaps proved in a special ridged basket known as a ‘banneton’ - or my favourite French-inspired ‘tapered baton’, and then through ingredients used, the sky really is the limit. All that’s needed to bake sourdough bread is flour, water and salt but simply by using different flours, the appearance, texture and flavour of a loaf can be played with. 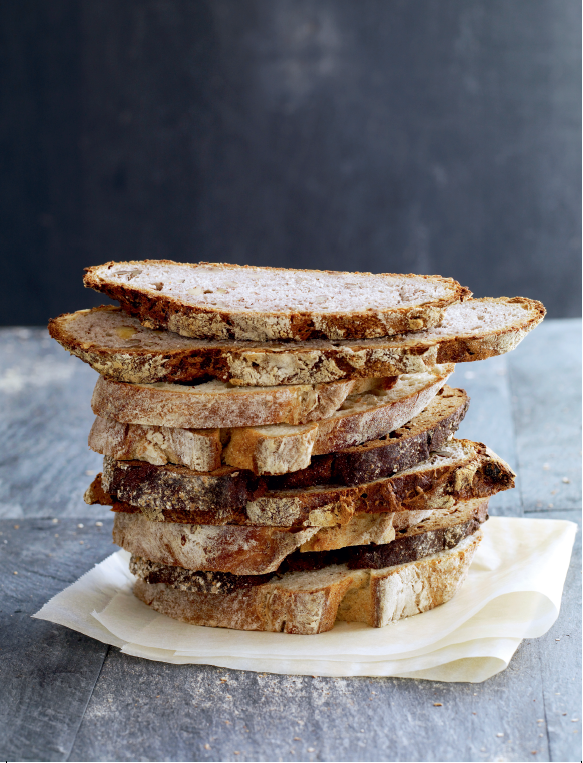 My favourite would be an organic granary, or malted one, which gives a lovely nutty flavour – but flours can be mixed up; including some white flour lightens the texture of the final crumb, and dusting loaves with rye flour, which has a lovely grey hue, gives a great-looking finish. Adding seeds like sunflower, sesame, poppy, or grains adds interest and crunch, and slashing the surface of a loaf just before it’s baked gives a final, personal touch which also encourages the bread to open up along these lines as it expands. There really are no rules for playing with ingredients – from dried fruit to nuts, herbs, beer, honey or chocolate, anything goes. Among recent favourites have been a prune and walnut loaf, which always pleases at a social gathering, and a grape focaccia, which was visually stunning! Perhaps what feels so challenging is that it demands patience, care and slowing down, a conscious setting aside of time and attentiveness that provides an antidote to the demands of modern living. It’s so easy to get stuck in the habit of measuring personal and professional success in the number of daily tasks you can tick off, rushing from one thing to the next in order to feel that you are achieving. In contrast, the very mindful nature of sourdough production is that it can’t be rushed, in fact the very essence of its success, and the accompanying feelings of satisfaction and pride, are bound into the amount of time it takes. Making space for rituals that tap into creativity and bring simple joy is a way of taking care of yourself; when you slow down, you tune into the present moment, experiencing more deeply with all your senses, and noticing some of the smaller pleasures that may otherwise pass you by. Getting to know the tangy grass-scent of a well-fermenting sourdough starter, learning to assess when loaves are baked through smell alone or basking in the thrill of biting into a still-warm slice of bread, spread with simple butter and home-made jam; these all add up to ways of treating yourself with kindness – to the ‘time out’ that’s essential for keeping personal battery levels topped up. If you’re teetering on the edge of conversion to the sourdough way of life, knowing that eating the fruit of all that careful labour is really good for you makes it even more worthy of its status. 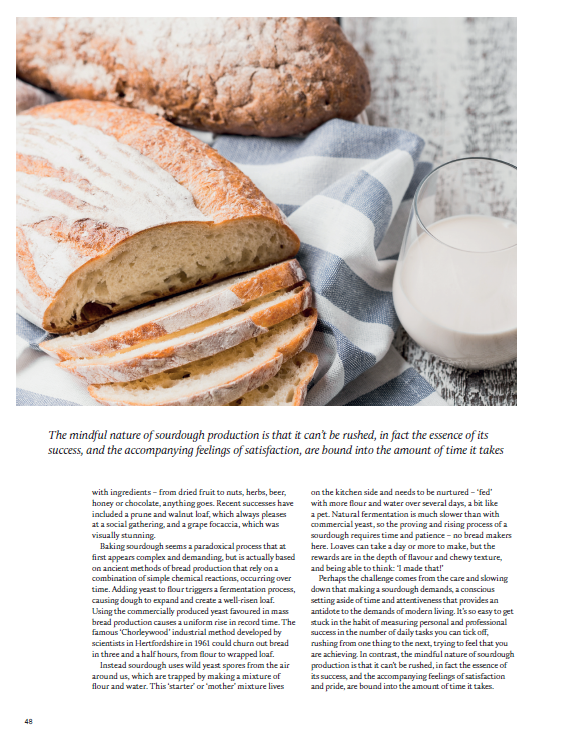 Sourdough contains a higher proportion of the lactobacillus bacteria, which work together with yeast to pre-digest the starches in the flour, meaning you do less of the digesting work. This is aided by the lengthier time taken to prove the dough, which breaks the gluten down, meaning many people who have a gluten intolerance say they can tolerate it. In addition, the long fermentation process increases the beneficial bacteria present in the bread, and hence the gut - and important nutrients such as iron, zinc and magnesium, antioxidants, folic acid and other B vitamins and micro-nutrients become easier for your body to absorb. OK – so choosing to bake in this way has not always been straightforward – more than once I’ve wailed with the frustration of taking an unrisen, rock-hard loaf from the oven, after all my efforts, knowing that somewhere along the way I got it wrong, but there’s something about the constant process of learning about the sourdough way that somehow mirrors the bumps, dips and jubilant triumphs we get to experience as a natural part of life. There’s always something new to learn, some tool or proving basket that adds to the experimentation and fun of the experience. And, in the giving of a freshly baked loaf, wrapped in paper and string and left on a door-step still warm, a gift is made that communicates something of time, care and love that words cannot really convey. Until the development of commercial yeast in the 19th century, all leavened bread was sourdough, made using wild yeast. Cultures across the globe developed their own methods that are so steeped in history, they originate from long before the written word. The oldest loaf ever found was made in Switzerland in 3500BC, and the ancient Egyptians knew both the process of baking and the brewing of beer, as recorded on wall paintings, and found in dessicated bread remains. The overlap between brewing and baking is reflected in monasteries producing both bread and beer, using the oven’s heat to dry grain and the yeast to raise the bread. Bread-making became an intrinsic part of community life, just as a wind - or watermill was a part of the landscape. The farmer took his grain to the miller, who supplied the baker. Once the bread was baked, ovens were open for common use – a tradition that still exists in many rural communities. Jo Bisseker Barr is an Accredited Psychodynamic Counsellor and Writing for Wellbeing Practitioner living and working in the New Forest. She runs ‘Write your Mind’ experiential workshops in writing for wellbeing from her home and lunch, including sourdough and afternoon cakes are all homemade.